If you’re still struggling with how to best utilise Social Media for your brand, let us point you in the right direction with our three simple rules. Nowadays, if you are to hear about a new brand or company, it is more often than not through a link on Facebook, an eye catching Instagram post or a Tweet suggesting a LinkedIn page. Using Social Media platforms has become much like second nature to many of us as individuals, but for businesses, these channels can be developed into a vital digital ‘tool kit’ to build a stronger and more impactful consumer experience. Having said that, many companies out there are still struggling to jump on board and be successful with the medium. As something which started out as an arena to share family photos or life updates, it can be difficult to justify the time and budget to invest in utilising social media to it’s full potential until you’ve seen the results for yourself. Trends for 2017 show many companies putting consumer experience at the top of their priority list. The top four sub-percentiles of focus include Content Marketing, Social Media Engagement, Targeting and Personalisation and Brand Building; which are all digital related areas. Highlighting these areas for development indicates the growing value in consumer experience and subsequently B2B relationships that come through promoting a strong brand image and experience on your channels. It is important to ensure your company has a distinguishable brand image across your channels in order to remain recognisable amongst profiles of others. Ensure that your ‘Brand Guidelines’ documentation covers your social media presence so that even with multiple administrators, your brand is not diluted. Reading any page or platform that represents your brand should feel nothing but familiar to the consumer. Using a continuous writing style across all platforms will tell your audience that what they are reading definitely came from your company. This helps to build a level of trust between yourself and your consumer which in turn makes their experiences more enjoyable and memorable. A personable approach with the consumer is becoming increasingly popular. The ‘Innocent’ Drinks Company were one of the first, and still one of the most effective brands to use this approach with their consumer audience. Their chatty, conversational language can be recognised across all their social platforms and even on the side of their products; their twitter feed being a perfect example (www.twitter.com/innocent). The rule for imagery follows suit - much like language, the images you post must be relatable and suitable for the brand image. 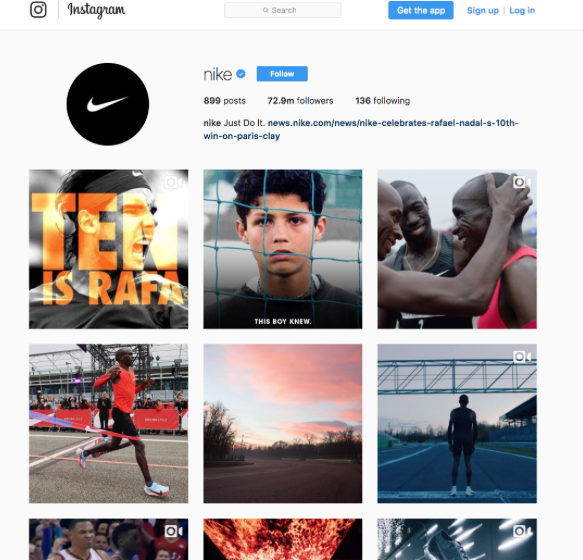 With an audience of near 73 million on Instagram (www.instagram.com/nike), Nike have demonstrated their imagery is highly effective. They have an obvious gritty, sporty mood to their images, edited with dark cool tones that establish the character of Nike and it ties in with the famous black swoosh that is their logo. To compare, Innocent also have a distinctive style (I know we’ve already acknowledged their brilliance but they really do know what they’re doing). 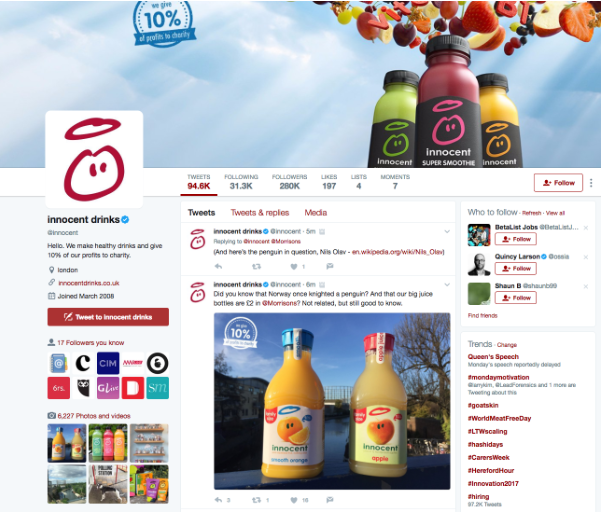 Their social media hosts healthy, bright, fruity colours that could only be associated with Innocent drinks, and any of Innocent’s consumer audience would see that. As mentioned within imagery, it is important to build up an association of your brand image with your consumer. Most well established brands have a very distinguishable logo and colour palette, as you may have noticed yourself, you begin to associate certain colours with brands you are familiar with. 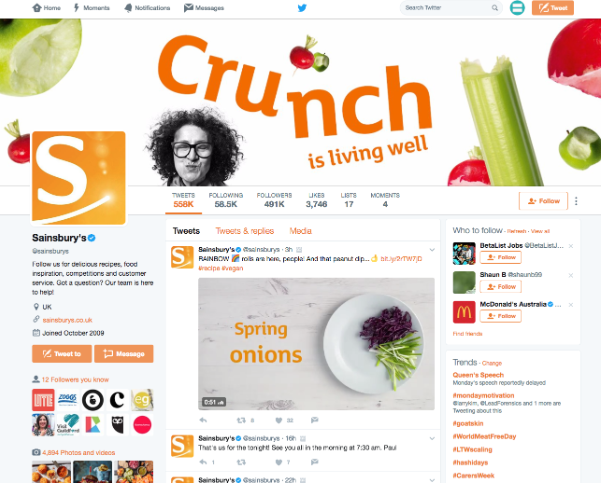 =Sainsbury’s use the colour orange in their logo as well as across all their social platforms as a form of a base colour (www.twitter.com/sainsbury’s). Regular use of one predominant colour will help to build an association for your consumers, causing them to think of your brand subconsciously, which will most likely lead consumers to use your brand over others - which is never a bad thing. Continuity, as discussed, is key for brand distinguishability. However, it is important to understand the difference between ‘cross promotion’ and ‘cross posting’, as while one is beneficial to your improving consumer experience, the other can be unintentionally detrimental. Cross promotion is the method of layering information by linking consumers across your digital channels. Say you decided to redesign your website, created a whole new webpage featuring blog posts or started providing a new service for your consumers; promoting via your social media would be the most effective way to drive your audience from one channel to the next. The inbound links are great for Search Engine Optimisation, but also, why not reach out to the audience you have curated to tell them something interesting? Don’t spend ages writing helpful blog content or launch a new line of products only for nobody to know it’s happened. Furthermore, cross promotion encourages consumers to explore further into your brand’s digital presence, rather than staying on one page, making their user experience more memorable and enjoyable too. However, each platform should also have content tailored to its purpose. For instance, a glossy image or short video would be more suitably placed on Instagram or even Facebook, while Twitter would be better suited for posting interactive questions or alerting consumers of news. Cross posting across digital platforms, when the same content has been copied, can be considered ‘lazy’ by the consumer. It also shows a lack of understanding of the digital platforms the brand use; as all social media, as previously stated, serves a different purpose. Lastly, once you’ve established a strong social media presence with thought out content tailored to each platform, tie it all together with your shop front - your website. If you’ve spent ages nailing valuable content, use it to keep your site refreshed, interesting and importantly, feeling modern and connected. In the same way we want to push people from our Social Media channels to our websites, the opposite also applies. 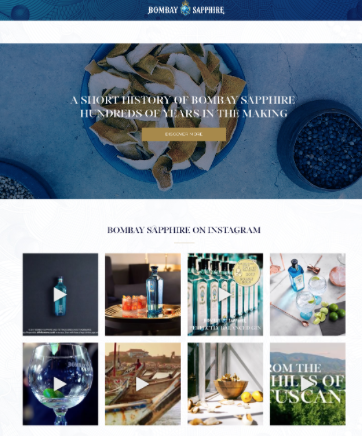 If your brand is all about appealing aesthetics and striking imagery, include an automated feed from your Instagram profile on your homepage. Nothing is worse than a static homepage with content which never refreshes, and an integration with this platform is visually attractive. For example, head over to Bombay Sapphire or beauty giant, L’Oreal, to see how they do it. If you’re an organisation looking to appeal to professionals, include a ‘Sign up using LinkedIn’ integration. This saves the user having to create another account with you, and automatically populates their details from their LinkedIn profile and in doing so, alerts them to your company profile. Invite them to connect at the same time, and you’re curating a captive audience of clients for future ‘micro-marketing’ updates via their professional profiles. 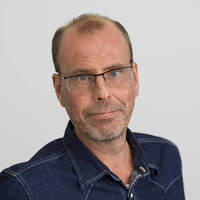 Our sister company, LiquidityChain, utilises this integration successfully, as does another client of ours in a slightly different manner - Grolsch beer. Formulate built Grolsch’s corporate website which tells you everything you need to know about working at Grolsch, including who in your personal LinkedIn network already works there! More unusual integrations like these can be a simple showstopper in the right context, and there are plenty more where that came from. The list goes on, but ultimately, no matter which industry you are in, the right social media integration is out there to really enhance your website, strengthen your brand and cultivate the right audience for your business online. 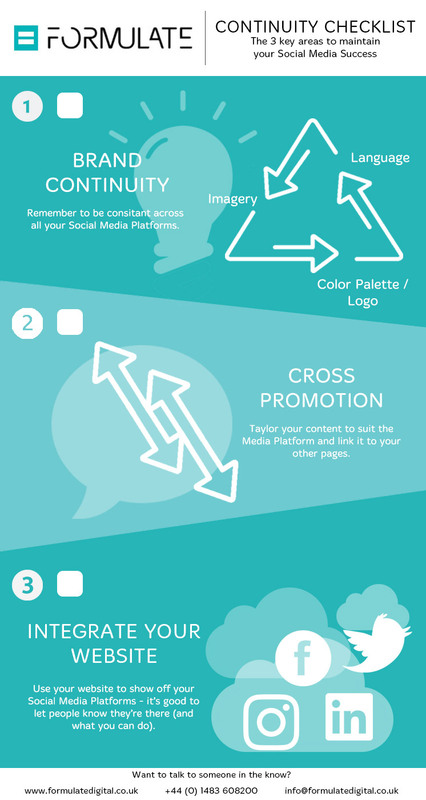 If you would like to take on developing your Social Media Platforms yourself, we have created a Continuity Checklist to keep - to be used as a visual guide based on the information shared here. But… time is a precious thing and if you’d rather spend yours on other tasks, we are always here to help. Simply tell us who you are, what you’re about and what it is that you are looking to achieve online - let us do the leg work, from planning to implementation.